Seamlessly integrate data from diverse systems, devices and sensors into the Industrial Internet of Things.The SmartSwarm 342 IIoT gateway helps owners and operators of remote assets integrate data from those assets into IIoT applications such as dashboarding, analytics or predictive maintenance. Data can be collected from a number of sources, including web feeds or databases and locally connected physical devices and sensors. 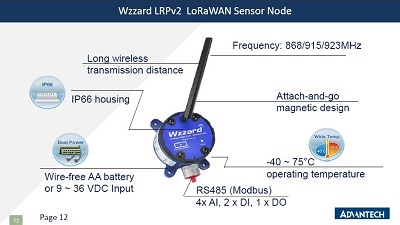 SmartSwarm 342 includes an interface and manager for B B SmartWorx Wzzard wireless sensor platform for acquiring and transmitting sensor data wirelessly without the time or cost involved in installing cables. For bulk I/O requirements where cabling is not an issue, it is also compatible with Advantech’s WISE and ADAM Ethernet connected I/O modules. User Applications - SmartSwarm 342 offers flexible data acquisition, processing and handoff via an inbuilt Node-RED user application environment. Node-RED is a powerful, simple to use application programming environment for processing data streams. Users drag and drop function nodes to acquire, process and output data via an internal web server interface provided by the SmartSwarm 342. The Node-RED environment is containerized, meaning that any user error made in programming cannot crash the gateway, which will remain connected and available for remote management in order to correct the error without the expense of a site visit.In addition to local data processing, the Node-RED environment is able to create and serve local dashboards, providing a mechanism to serve summary data to engineers, managers or operational staff. Connectivity and Security - SmartSwarm 342 connects to enterprise applications via a local Ethernet WAN. In addition, the gateway provides a second Ethernet port for a local LAN connection, bridging traffic from this LAN to its active WAN connection. Configuration - Configuration is achieved via the SmartWorx Hub remote configuration management tool. This provides access to all of the configurable parameters, and also allows the download of additional Node-RED nodes to enrich the base installed palette without the need to visit the site.